Although I have the three milky glitter nail polishes of Tony Moly in my possession for a while already, I have not officially put them on my nails yet besides some swatching. Today, I have finally found the time to wear them. 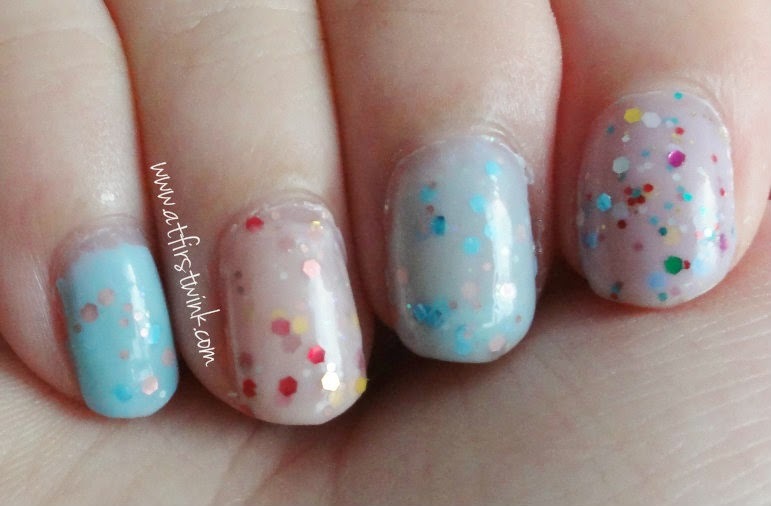 From left to right: Tony Moly GS09, Tony Moly GS10, Beauty world dot artist set polish A with a layer of pa nail color premier Lame grande AA37 on top, Beauty world dot artist set polish A with a layer of Tony Moly GS08 on top. I have noticed that you need to put three layers of the Tony Moly nail polishes on each nail to achieve the best results. I have also used a really pretty baby blue nail polish of the Beauty World dot artist set produced by the Japanese company Lucky trendy to see if the Tony Moly GS08 will look better over it or not. In the third picture, you can clearly see the difference of having no base color and with a base color. I actually like it better without a base color, since it looks more milky/yoghurt like. 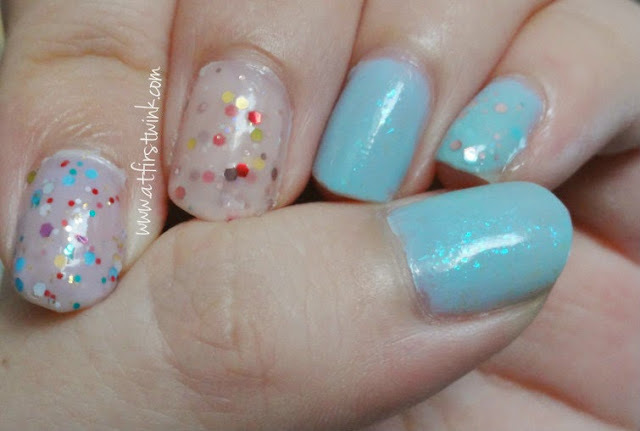 Because the baby blue also looked very pretty on its own, I used one of my pa nail polishes, the pa nail polish AA37, to just slightly enhance the color with some sparkly flakies. 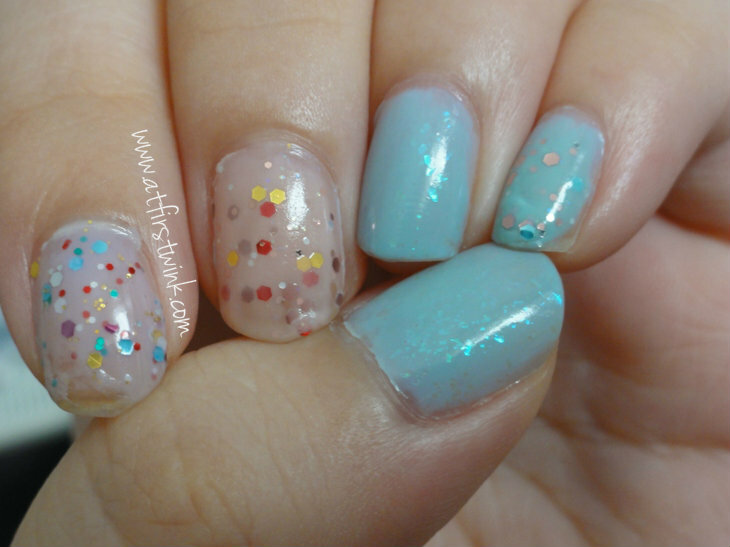 On the pinky, Tony Moly GS08 over a baby blue polish and on the middle fingernail Tony Moly GS08 only with three layers. During my trip to Hong Kong and also to Japan, I bought these two Lucky Trendy Beauty World trio nail polish sets. I first bought the set on the left, the Beauty World Dot artist Set DNC 682, in Hong Kong. I found it in the Isquare mall, Tsim Sha Tsui, for HK$63. The beautiful blue nail polish on the nails in this post was from this nail polish set. When I was in Japan, I also bought another set, the Beauty World French nail set FNC 684 for 714 Yen.